Browse: Home / 2017 / February / 07 / Expert Hurricane Forecaster Says Upcoming 2017 Season Likely To Be “Worst/Costliest” In 12 Years! Ocala, FL (PRWEB) Global Weather Oscillations (GWO) veteran meteorologist David Dilley says in his early forecast that the 2017 Atlantic hurricane season will be stronger than last year – with the potential for 6 named storms making United States landfalls. It will also be the most dangerous since the 2005 season, which saw 5 hurricane landfalls and 2 tropical storms. GWO has issued the most accurate preseason predictions of any organization the past 8 years, including last years’ prediction that the “Atlantic Basin” (which includes the Caribbean Sea and Gulf of Mexico) – would enter a Climate Pulse Hurricane Enhancement Cycle in 2016. David Dilley, Senior Meteorologist for Global Weather Oscillations (GWO) – correctly predicted months in advance that GWO’s prediction zones for the Florida Panhandle and Florida’s East Coast northward to North Carolina – would experience hurricane and/or strong tropical storm conditions in 2016, with multiple strikes likely (see GWO’s 2016 hot-spot predictions graphic). Here is the GWO’s prediction from last year. As it turned out – 5 named storms made United States landfalls with Hurricane Hermine making landfall on the Florida Panhandle in the Eastern Upper Gulf (see Hot Spots graphic). But more importantly was Hurricane Matthew – a major hurricane that moved north across Haiti and the Western Bahama’s – then hugged the coastal areas from Florida to North Carolina. 1,739 people died from hurricanes in 2016, most of which were from Hurricane Matthew in the Caribbean. The last time the death toll was that high was in 2005 when nearly 4,000 people were killed by hurricanes. The official hurricane season begins on June 1 and ends December 1. The Atlantic Basin on average has 12 named storms, 6 hurricanes and 2.7 major hurricanes. As predicted by GWO, the 2016 hurricane season was more dangerous and costlier than average. The official season (minus Hurricane Alex in January) – had 14 named storms, 6 hurricanes and 3 major hurricanes – and the United States experienced much above normal activity with 5 out of the 14 named storms making landfall in GWO’s predicted Hot Spots, 2 of which were hurricanes (Mathew and Hermine). GWO’s Climate Pulse Hurricane Model indicates that 2017 will once again be influenced by a Climate Pulse Hurricane Enhancement Cycle – with very conducive conditions for hurricane development due to the lack of an El Niño, or La Niña conditions. In addition ocean water temperatures continue to run warmer than normal across most of the Atlantic Basin (red and orange in the graphic), and especially in the Caribbean region and the Atlantic near the United States. This warmer ocean water will be conducive for tropical storms and/or hurricanes forming and/or strengthening close to the United States. Mr. Dilley, a 40-year veteran, also expects the Bermuda-Azores High Pressure Center will be weaker this summer – thus allowing more named storms to maintain strength – or strengthen as they move from east to west across the Atlantic toward the United States. He believes the upcoming 2017 hurricane season will be stronger than last year, and it will be the most dangerous and costliest in 12 years for the United States. The upcoming season will have 16 named storms (14 last year), 8 hurricanes (6 last year), and 4 major hurricanes (3 last year). In addition the United States will have the potential for 6 named storms making landfall, the most since the 2005 season that saw 5 hurricanes and 2 tropical storms make landfall. GWO also expects 3 out of the 6 landfalls will be hurricanes – with 1 or 2 having the potential for being a major impact hurricane. More information is available at GlobalWeatherOscillations.com, or GlobalWeatherCycles.com. GWO is the only organization that issues detailed predictions two years into the future for 11 United States prediction zones stretching from New England to Texas. GWO’s hot spot zone predictions for the United States have been nearly 87 percent accurate since 2006 – with GWO correctly predicting 1 to 3 years in advance – the occurrences of Hurricane Ike (2008), Irene (2011), Sandy (2012), Matthew and Hermine (2016). Detailed zone and hot spot predictions for the 2017 and 2018 hurricane seasons can be obtained through GlobalWeatherOscillations.com, or GlobalWeatherCycles.com. GWO and Senior Meteorologist/Climatologist David Dilley is an expert on climate cycles and climate change. A “free” climate change e-book “Earth’s Natural Climate Pulse” (authored by Mr. Dilley) can be acquired through the Global Weather Oscillations web site. The heart of the matter seems to be Mr. Dilley’s extracting from very long term Milankovitch Cycles to determine decadal variations in weather activity. He might have a point and the history is on his side. On the other side is, that it is better to forecast worse weather than better. Peoble are less anoyed when it turns out better than forecast. No doubt the usual suspects will shout “climate change”. I wont … I’ll shout “unmarked advertisment” instead. What’s up with those prweb.net links in the article? Like a baby shouting for his bottle. Fake Climate Science: Remember When Mainstream Media, Obama & Other “Experts” Claimed Severe Weather Was Increasing? Under the circumstances they could hardly be LESS severe could they? You can’t get less severe than ZERO landfalling cat 4 & 5 Hurricanes, it will only take 1. Since there hasn’t been a noticeable hurricane landfall in the US in so many years, any hurricane landfall is likely to be costly. People aren’t accustom to being hurricane ready any more. Yep, hurricane seasons have been low in activity for so many years now, maybe we are due for an active one. But there have been forecasts over the last several years have also been for active season… believe it when it happens. Insofar as some others claim FL will soon be under water, now would be a good time to clean the yard, paint the house, and sell in March. March is a nice time of the year in FL. Leave directions for a proper Huracán-Party. Not like in the 1950’s when CO₂ was ALL POWERFUL ! 2016 1,739 Hurricane victims….where did they get the death toll figure from, crack addicts in cuba…cholera victims in Hispaniola…car crash victims in key west…show me the bodies. if I could remember my latin… Habeas Corpus although strictly speaking means you may have the body.. Me FundMe wants to see the body. But hey, it could also lead to less storms, so why bother with the facts? 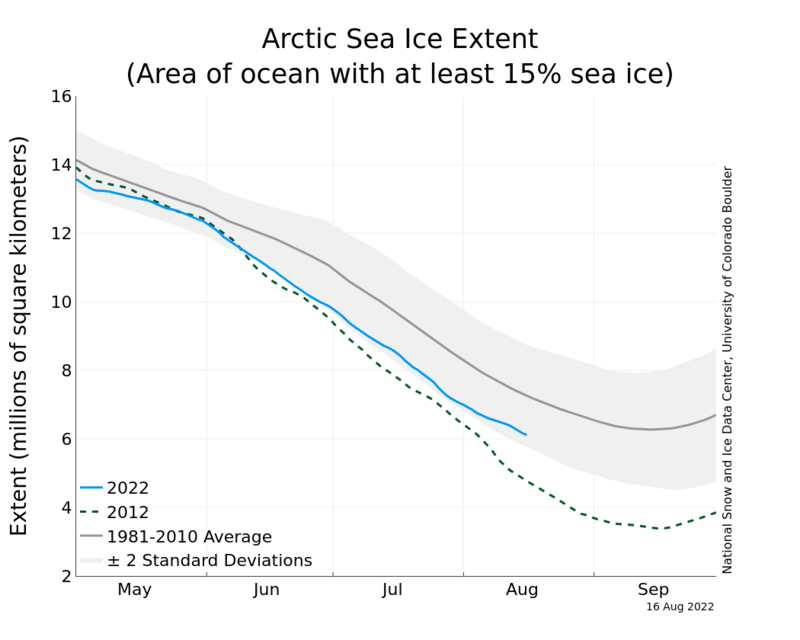 Nothing scary about Arctic sea ice. A single less cold spot over the Kara Sea. Very few people live there. What is SCARY is the FREEZING COLD over most of the rest of the Northern Hemisphere, where millions live. But let me guess sob, YOU DON’T CARE..
…. even though MANY of those suffering from energy poverty are your OWN COUNTY’S people. That is TRULY DISGUSTING of you. Really scary, one cold winter after lots of warm winters … now who is the alarmist? Nobody in Germany is suffering from energy poverty. If you can’t pay the bill the state is paying it for you and there is no shortage of available energy. Not for heating purposes and no electricity shortage either. The low wind phase at the end of January was nothing compared to the same period in 2016 where gas power plants had to deliver 150% of the output they had to this year. Still no paper to wipe your assets with, I see. So funny to watch you worming, squirming, supported by people who actually work for a living… pathetic. No wonder you are so embarrassed with yourself. ! I assure you it is equally fun to watch your poor attempts to troll me. Totally irrelevant here. But you google the phrase in you end up at Breitbart, which got the story via daily mail directly from the German pamphlet “Bild2 which is known for never telling the truth. But the best part of looking at real facts is the structure of the report. Your righwing sources make a huge thing out of a claim about 11 attempted murders by left wing extremists since 2009. in the actual report, you have a passage directly above the left wing activity about a right wing group called “reichsburger”, which are described as some sort of a nuissance to officials. but they did actually kill someone in 2016…. Paper paper.. wherefore art thou, paper. Also poor paper, I knew him…. never. Seems the very basis of sebtroll’s “belief” is nothing but a figment of his hallucinogenic dreams. 92 percent of left-wing activists in Berlin, Germany, live with their parent. Uhm, we’ve had 1 warm winter in the last 5 here in Maine. Right on the average this year. Are you telling the truth, SebastianH? Higher energy prices obviously hit people harder that are using a bigger share of their income to cover those costs. But is it causing poverty? No. Prices for heating are pretty low and the natural gas price just got reduced by over 10% in our region. If you are poor in Germany you get social welfare and the goverment is paying your (heating) bills. Do you think that Germany is some kind of third world country? Half of the electricity price increase is due to inflation. If a person lives in poverty because he/she can’t afford to pay a 70 € monthly electric bill (3500 kWh 2-person household) instead of a 50 € bill than something else has gone wrong. That’s not the fault of a 20 € (inflation-adjusted) increase over 16 years … really. 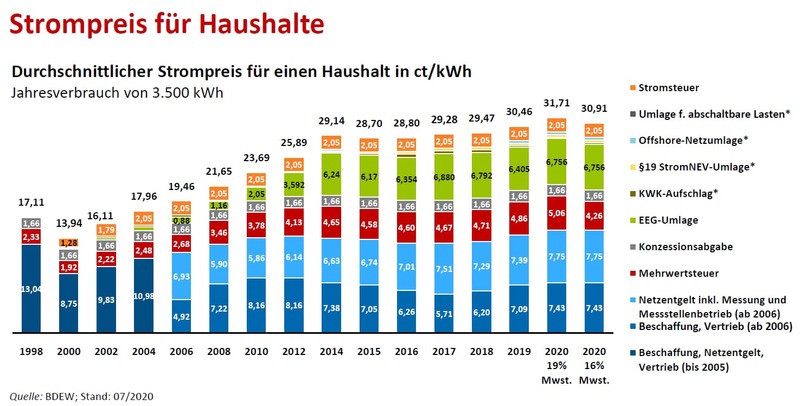 Why are you quoting Lomborg on electricity prices in Germany? Everything he writes is false and if you look at the data, you also see that he chose to compare with the year 2000 because this was the lowest price we had . Things do not get more dishonest! Sorry sod, but Rozendaal is not the person who is being dishonest here. It would not hurt to have a look in the mirror from time to time. SebastianH, the term you originally used — energy poverty — has a specific definition. Those who spend more than 10% of their income on energy are classified as being in energy poverty. You claimed that no one in Germany is suffering from energy poverty. The official numbers show it’s 6.9 million (as of 2014). Obviously, now you want to move the goal posts and claim you were actually not talking about energy poverty, but poverty. Why not just be honest, SebastianH, and admit you were wrong? And you’re still minimizing the real pain that poor people (and especially the elderly) experience because they have to subsidize solar and wind projects. Idiot, the State DOES NOT pay the bill. Where do you think the state gets its money from? Oh I forgot the magic money tree, sorry. this “argument” is stupid beyond believe. The “scary cold” in the northern hemisphere is pretty much a normal cold winter as real data shows. But why bother with facts, when you have a strong opinion, eh? on and on it goes……. You are a tedious warmist bore, Sod. Well SOD, speaking of yourself there “Why bother with facts” Your lack of self awareness is very sad. As a real scientist, I would say that made 2016 an average year. (In the 20 years from 1991 through 2010, for example, the average number of Atlantic tropical storms, including hurricanes, was 13.3, with a standard deviation of 4 (not including the outlier year, 2005, which had an anomalous 28) or 5 (including 2005). So 2016 was well within 1 standard deviation in the number of storms total, and right on the average for both hurricanes and major hurricanes. I gave a link to the detailed Atlantic storms data, from 1851 through 2010, in my October 5, 2012 post, “Hurricane/Tropical Storm Strengths, 1851 to 2010”.